A webhook is a method of augmenting or altering the behavior of a web page, or web application, with custom callbacks. These callbacks may be maintained, modified, and managed by third-party users and developers who may not necessarily be affiliated with the originating website or application. 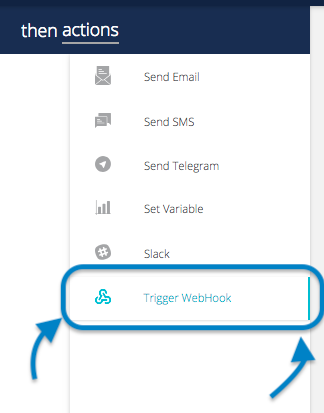 Select the Device and the Variable with which you want to configure the conditions for your Webhook. Now, just need to setup the Webhook to the 3rd party resource. 1.- The application/json content type will deliver the JSON payload directly as the body of the POST. 2.- The application/x-www-form-urlencoded content type will send the JSON payload as a form parameter called "payload".